I enjoyed The Three Billy Goats Gruff as a child as well. But I think my all-time favourite book from my childhood is Love You Forever by Robert Munsch. My great great aunt had lots of story books left over from her teaching years when I was little. She lived with my grandparents for her last handful of years and I remember spending hours sitting with her being read to -- and then reading to her when her vision was too poor to see. My favorite was a ratty old book from the 1920s and my favorite story in that was Tiki Tiki Tembo. I tried for YEARS to say the whole name correctly from memory (and I still can't!). Great list! I think my all time favorite childhood book is Doctor DeSoto which is about a dentist mouse. I've never read any of your top 10 (except Harry Potter, of course! 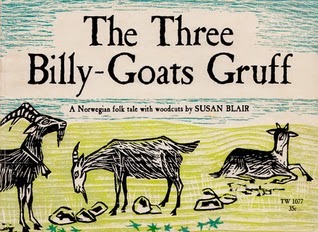 ), but I think we had that exact copy of Three Billy Goats Gruff when I was a kid! Seeing it reminds me of our old copy of The Seven Chinese Brothers, which was my go-to books for a long time :) So nice to revisit old memories! The Worst Witch and Katie Morag! How did I forget them?! My favorite book as a child was The Ice-Cream Cone Coot and Other Rare Birds. It's #1 on my list. Besides Harry Potter, I haven't heard of the books on your list. I hope you come across them eventually so you can re-read them. You've got so many good books on your list :-) It has made me feel very nostalgic! My TTT. Oh, I used to looove all those school stories like Enid Blyton and the later Katy books. Nice list!